As Kurt told us, it’s not over ’til the fat lady gets home. Well, the little fat man got home at 2am on a bus masquerading as a train. 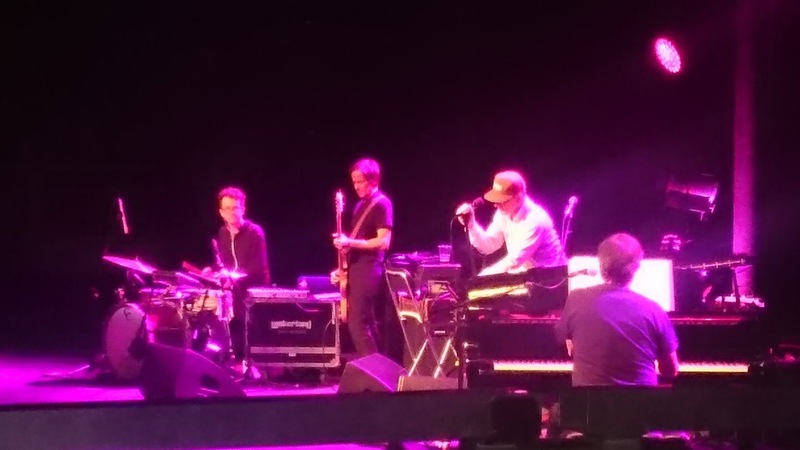 And yet, the memories of Lambchop’s gig at the Roundhouse in Chalk Farm remain, well, not fresh exactly, but warm, sentimental and somewhat romantic – but then, it’s a Lambchop gig, so that should come as no surprise. This was a much smaller line up than when I saw them at the Barbican playing their way through the whole of Nixon, the album that brought their commercial peak. Tonight, bass, drums (digital and acoustic, with a smattering of synth noodling), piano (doubling up on stand-up routines) and Mr K Wagner Esq. on Gibson archtop, synths, midi-controller(?) and vocals, played mostly from the songbook of new album FLOTUS – a reference to Democratic political activist and former record shop owner Mary Mancini, whose husband just happens to be the Lambchop front man. FLOTUS is not an album I know well yet, suckered as I am still most often by the charms of What Another Man Spills, which is where Lambchop started for me in 1998. (Even at 21 I was essentially 42). If pressed, I couldn’t write out a set list for last night, not least because many of the new songs are built on similar foundations: lightly brushed drums, intricate but mellow bass lines, deft piano accents and Kurt’s voice, swamped in analogue delay and a softly doubling chorus that substitutes for the album’s experiments in autotune. And it’s a unique voice: a rich, mellow (there’s that word again) baritone. Settled in a comfortable mid-range, words are half sung, half spoken. It might become monotone if not for occasional swoops from subterranean Isaac Hayes rumble to highfalutin’ Curtis Mayfield yelps. In truth, over the last few albums, Kurt’s vocals had, to my ears, become more staccato and compressed. Here, the swathes of delay fill out the sound until it becomes truly organic, despite its digital support. The side effect is that many of the words are indecipherable, which for a band benefiting from Kurt’s unique, sharply observed and very funny view of the world, seems a shame initially. But on the FLOTUS songs, the voice is treated as another instrument in the mix and I couldn’t be absolutely sure there were actual words for which to strain. Of course, just occasionally clarity broke through the soup and when it happened my companion and I were reduced to fits of giggles as a perfectly created and witty image was skilfully sketched in a handful of words. If FLOTUS really is the album Kurt wrote in the hope that Mary might find room for it in the car alongside her more modern pop sensibilities, then I hope she only plays it on journeys without a pressing time of arrival. As the band settles into each casual groove, moving along with impeccable taste and little haste, the audience is lulled into a meditative state. This is music for travelling at a steady 55mph on a die straight highway with the wheel locked off, roof on, lost in thought. Some people took the chance to sleep. And it was quiet enough to sleep. Never have I heard a band delight in playing as quietly as Lambchop. Had the set continued until 1am, none of the Roundhouse’s neighbours would have had cause to complain. After a solid hour and 40, the gig ended with an encore straight out of Lambchop playbook. Would they play the big hit (if there is one, it is probably Up With People from Nixon) or maybe wheel out the cover of Young Americans that wowed the Barbican audience back in January 2015? The band shuffle back on, drop into a easy groove and another low key, soulful gem emerges: Lambchop please by doing things their way and sincerely hoping you like it. And that’s that. Warm appreciation all around, received and reciprocated with typical Southern charm. Then we’re off, Lambchop most likely to sip a beer in silent companionship while I savour the delights of the train and the bus.